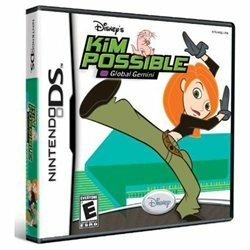 Kim Possible: Global Gemini ..
Kim Possible is back in the ultimate adventure when Gemini escapes from jail. It's up to the player to prevent him from rebuilding his evil empire and brainwashing Global Stations around the world. Players will travel with Ron Stoppable and Rufus, the naked mole rat, to the Swiss Alps, Egypt and an island in the Pacific and bring Gemini to justice.